In the same way that you can offer discounts on products price or on the cart subtotal, you can also offer woocommerce discount on shipping fees using the Woocommerce Dynamic Discount plugin. 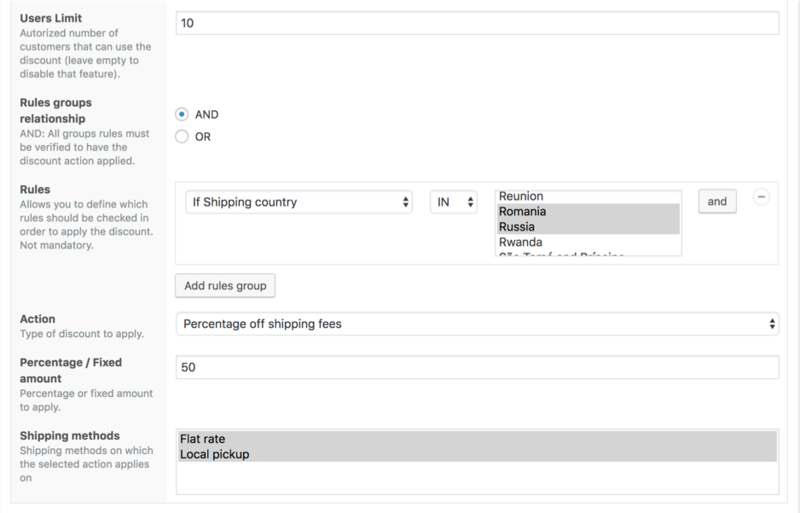 WooCommerce offers many possibilities to define shipping fees. In general we have three shipping methods which are Flat rate , Local pickup, and Free shipping (read more about them by clicking on the links). 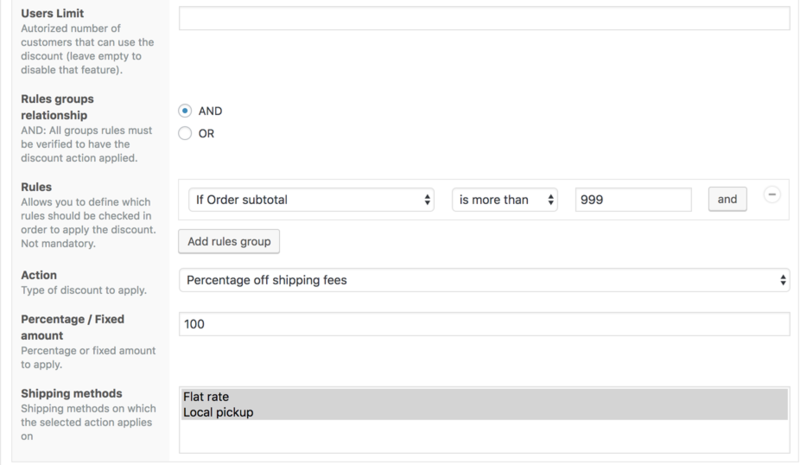 The Woocommerce All Discounts plugin allows you to apply discounts on shipping fees within the cart and this based on specific rules (which you can define in the discount settings). Woocommerce All Discounts works with rules and product lists. So you can create dynamic discounts based on product lists and some rules. 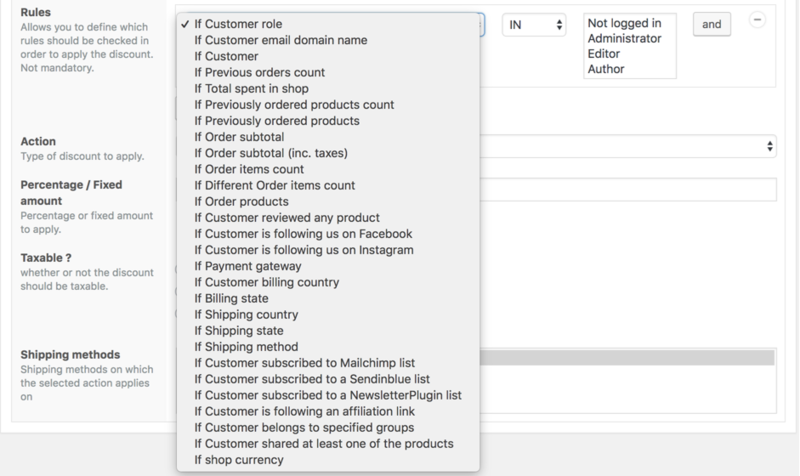 Click here to see how you can create product lists. Many rules can be used to create discounts and some rules can be coupled to create advanced dynamic discounts like the woocommerce discount on shipping fees. The image below shows you how to offer a 3% off discount on cart subtotal if for example the customer buys more than $500 worth of t-shirts. 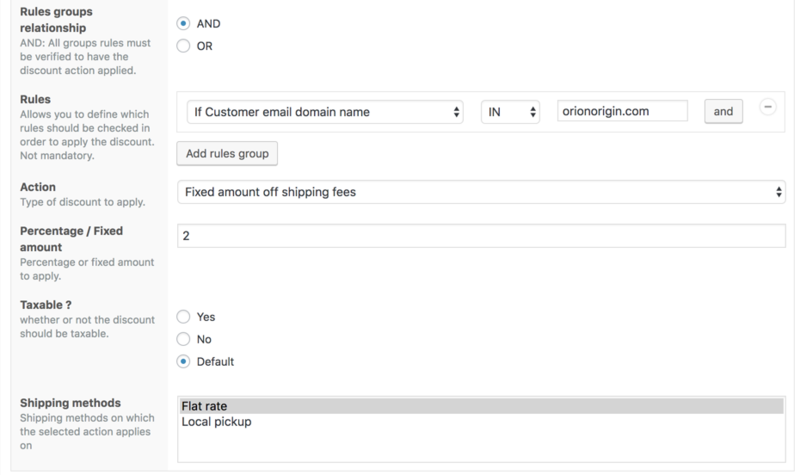 Now let’s see how to setup a woocommerce discount on shipping fees. Let’s assume that the product list has been created and the shipping fees has already been defined. If you’re not sure how to do that, please check here. The next step will consist in creating the discount. Choose the specific Action; the type of discount to apply. For shipping discounts types, we have three possibilities. Choose the shipping methods on which the selected action applies on. Here you have two possibilities. As said above, you have three shipping methods and only Flat rate and Local pickup can receive discounts. Note that Multiple choices are allowed here. This tutorial is to help you learn how to create a woocommerce discount shipping fees whenever you feel the need to do it. if you have any questions or remarks please leave it the comment section below.